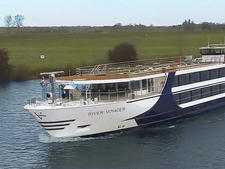 River Venture, which cruises from Paris north into Normandy and back to the capital, spent the first season after its 2013 launch cruising on the Rhine River. Vantage moved the ship in its fleet to the Seine in 2014 specifically because of its size and ability to dock in Normandy at the port of Honfleur, where the Seine empties into the rough waters of the English Channel. 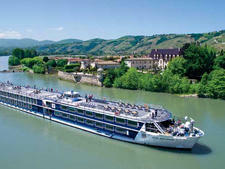 Unlike some other river cruise lines, Vantage can sail directly to Honfleur on most departures. At 360 feet, the ship is about 80 feet shorter than many of its former competitors on the Rhine, but it also carries as many as 65 fewer passengers. 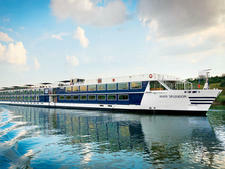 And odds are the 134 passengers the ship does carry will be American on most cruises; over 95 percent of River Venture passengers hail from the U.S. Onboard River Venture, there's a focus on function over form. Decorations are neutral and largely monochromatic, with browns and beiges and wood accents throughout the ship. The furnishings are simple. The ship's exterior isn't beautiful, and its interior decoration is closer to that of an airport hotel and conference center than a luxury hotel. But in-cabin conveniences, like a wonderfully spacious bathroom and top-notch entertainment options, make the onboard experience pleasurable. Ultimately, Vantage has thoughtfully and strategically combined a few high-end perks with a mid-grade product to bring the overall experience to a higher standard. Like other ships in the Vantage fleet, River Venture is a "quiet ship," meaning there are very few announcements over the PA system. A spokesperson for Vantage said the program is a recognition that its clientele doesn't necessarily need to be told what to do "every minute of the day." 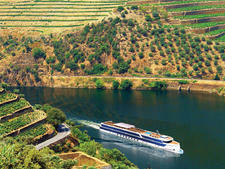 The general age for river cruise passengers is 60 and older, which is the typical demographic onboard River Venture. In effect, Vantage's demographic is entirely American, and the line's offerings are catered exclusively to American tastes. Some passengers will be visiting Europe for the first time, though with Vantage's broad portfolio of package tours and high number of repeat customers, many passengers will be quite well traveled. Most are retired and relatively well-off. The language onboard is English, including all announcements. River Venture specifies "casual" as the mode of dress onboard. The definition is fairly loose during the day, with many passengers wearing jeans when it's cool out or shorts on warm days. However, jeans and shorts are not permitted attire for evening meals in the Compass Rose restaurant. For the Captain's Dinner, generally celebrated on the second night of the cruise, Vantage suggests a sports jacket or suit for men and dress or pantsuit for ladies. If you're planning on touring -- either with the ship's included shore excursions, optional extra-fee tours or on your own – don't forget a comfortable pair of shoes. Because the ship sails in France, with its lovely and historic landscapes, tours frequently involve walking on cobblestones and other uneven surfaces. 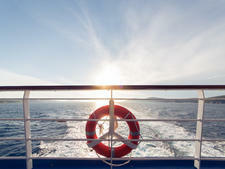 Tips for the cruise director and the onboard crew are not included in the cruise fare; tips for local guides and bus drivers are. The line suggests tipping nine to 11 euros per person per day to be shared among the cabin and dining room staff. Cash or cards are accepted for payment of gratuities, with card transactions charged in euros. The onboard currency is the euro, though dollars are also accepted for cash tips. An envelope is placed in each cabin prior to the end of the sailing for those wishing to tip in cash. This envelope should be deposited in the box marked "gratuities" at the reception desk.